The Rebalance to Asia: A Patch for U.S. Leadership? 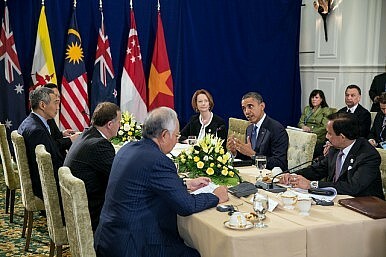 The U.S. needs to clarify its Asia-Pacific strategy if it is to be more than a temporary fix for declining leadership. First, let’s refer to George W. Bush’s “war on terror” as a contrast. However much this policy cost the U.S., it had a very clear and firm stand, very clear goals, an extensive range of partners, and isolated target enemies. What’s more, although the U.S. has paid tremendous costs both economically and militarily, in general the front line of anti-terrorism has been successfully pushed away from the U.S. homeland. The goals of such policies have been achieved, even though they also sparked criticisms. More significantly for the Asia-Pacific region, this strategy enabled the U.S. to win cooperation from all possible states, including rapidly rising China. Hence, the Sino-U.S. relationship successfully avoided enduring troubles and direct confrontations, and both sides maintained a wide range of strategic cooperation on issues like anti-terrorism. Under Bush, the U.S. continued the policy of “constructive engagement” with China that had begun in Bill Clinton’s administration, expanding the number of cooperative mechanisms and channels of communication between the U.S. and China. By contrast, the goals of the “rebalance to Asia” have been vague. The U.S. has repeatedly emphasized that “rebalance” does not aim to contain China. Yet, from the perspective of the U.S., the existence of an “imbalance” in Asia-Pacific region has been brought about exactly by the rapid emergence of China. So, if the goal of the “rebalance” is not to contain China, what is it? Obviously, the U.S. has yet to successfully convince China on this point. Should the “rebalance” aim to encourage the peaceful rise of China (so China will give up its excessive reliance on military expansion), the U.S. needs to invite and engage China in the more comprehensive global arrangements in which the U.S. may still practice its leadership, rather than, for example, excluding China from the TPP. Leadership can only be practiced in constant and constructive engagements; on the contrary, if estrangements endure, the probability of violent conflict or even war grow higher. Even with regard to U.S. allies, it’s hard to say that the current “rebalance to Asia” has been a policy with clear goals and prominent outputs. Even the so-called most faithful (and strategically the most important) U.S. ally in the region, Japan, has played hardball with the U.S. over the issue of TPP. Ironically, Japan continued to do so even after the U.S. promised protection to Japan should a Sino-Japanese conflict arise in the East China Sea. Recently the White House announced the “European Reassurance Initiative,” which seems to indicate that the U.S. has decided to tackle challenges brought from two ends (China and Russia), by applying patches to its global leadership. Obviously, though, patching can hardly resolve the root problems. With the global situation changing and multi-polarity becoming an inevitable trend, what does the U.S. need to lead the world for the next 100 years? For one thing, Washington needs a more extensive, more overarching, more systematic, and especially more inclusive strategy and policy design. The U.S., as the only incumbent dominant superpower, has its leading role and responsibilities in various aspects. However, as the dominant system is probably undergoing a relative decline, patching global leadership in select regions will hardly solve the problem. The newly emerged powers aim to take increasingly important roles in the transforming world system. The U.S. needs a clear strategy to handle this transition period.